How many Quakers are there? its first ever UK personal current account. to the UK market – will begin with a phased rollout from June this year. registered charity or community group meeting their ethical criteria. News release, 4th February 2017, from Quakers in Britain. In the statement made today (Saturday 4 February) by their representative body, Meetings for Sufferings, Quakers say, “There can be no peace without justice; no love without trust; and no unity without equality. Our faith urges us to welcome the stranger as our equal and friend, feed those who are hungry and shelter those who are homeless, needy and frightened. “’We are a people that follow after those things that make for peace, love and unity’ (Margaret Fell, writing to Charles II in 1660). Quakers in Britain see these values now under growing threat around the world, not least from recent developments in the United States of America. “We condemn all acts of government which set people against one another; which discriminate against people because of who they are or where they were born. We reject policies which condone suspicion and hatred; which turn away those who need and depend upon our help. We were not put on Earth for this, but to be a people of God, to live in harmony with each other. “There can be no peace without justice; no love without trust; and no unity without equality. Our faith urges us to welcome the stranger as our equal and friend, feed those who are hungry and shelter those who are homeless, needy and frightened. “Alongside Quakers in the USA, and their American Friends Service Committee, we stand with those whose lives are blighted by racist, discriminatory policies and those whose faith is denigrated by association with a tiny violent minority. We pray for the courage and steadfastness that will be needed as we uphold our testimony of equality, justice, peace, sustainability and truth. For us, prayer is inseparable from action. There can be no peace without justice; no love without trust; and no unity without equality. Could you and your spare room make a lasting difference to the life of a vulnerable young person in Sheffield? The team at Sheffield Supported Lodgings are looking for Sheffield residents who are willing to offer their spare room and support to help young people transform their lives. Supported Lodgings providers come from all walks of life and offer the use of their spare room for up to 12 months. In addition to accommodation, they also play a key role in supporting young people to develop the practical life skills they will need to live independently in the future. The Supported Lodgings team offers providers full support, training and guidance throughout from a designated member of staff, as well as a weekly payment of around £150. The new service is run by national youth homelessness charity Depaul UK (https://uk.depaulcharity.org) in partnership with Sheffield City Council. The charity also provides the hugely successful Nightstop South Yorkshire service in Sheffield, through which local volunteers to provide emergency accommodation for young people in their own homes. The Depaul Group was formed in 1989 by Cardinal Basil Hulme in response to the growing number of homeless people on the streets of London. He brought together as founders the Daughters of Charity of St Vincent de Paul, the Society of St Vincent de Paul, and The Passage day centre – all organisations rooted in the life and work of Saint Vincent de Paul. 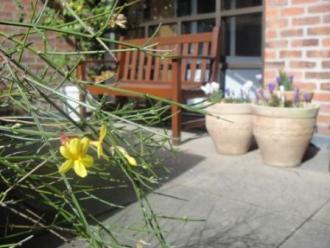 Though Supported Lodgings in a new service for Sheffield, it runs successfully in many other locations around the UK, including nearby in York. Nightstop Manager Amy Smith said: “The young people using Supported Lodgings don’t just need a roof over their heads, they also need a stable and secure home environment in which they are supported to mature and develop. Anyone interested in becoming a Supported Lodgings provider or finding out about other volunteering opportunities can get in touch via email at sheffieldsupportedlodgings@depaulcharity.org.uk, or by calling 0114 2787152. 5.45 – 6.15pm, Tuesday to Friday in term time. St James Bible and the Book of Common Prayer and an excellent choir. I’ve been saying for years that it’s the best free gig in town. and now I’m away to Spain for a week and fearful they’ll be singing to the stained glass and the silence. If you might consider going – it’s 5.45, Tuesday to Friday in term time, lasts half an hour – pick up an order of service in the foyer or just sit at the back in quiet contemplation. Jesus said that the poor will always be with us (Matthew 26:11), but he didn’t add – so that’s all right then ! Our responsibility to people in poverty never goes away. We are called to comfort those on the margins and challenge the reasons for poverty. The use of sanctions in the benefit system undermine human dignity and foundational Christian principles of justice as they impact hardest on those in greatest need. The majority of appeals against sanctions are upheld. The Government pledged in the 2015 election to make £12 billion of welfare cuts. The Chancellor has announced various welfare cuts since the Election but these fall well short of £12bn. In the Queen’s speech at the opening of Parliament in May 2016 there was a commitment to new legislation enact “to tackle some of the deepest social problems in society, and improve life chances”, yet the Government Green Paper on Disability (overturned by the Lords in November) would have had a negative impact on many people. We welcome the Chancellor’s promise in the Nov 2016 Autumn Statement that “The government has no plans to introduce further welfare savings measures in this parliament beyond those already announced” but continue to be very concerned about the impact of those already announced. We will be working to raise our concerns together to advocate for those communities and people in greatest economic need. We call upon our local and national government to ensure that any policies designed to cut the deficit and re-order the economy should impact least on people who are already disadvantaged. We call upon our local churches to pray, reflect and act to combat poverty in the UK, including making themselves more aware of the extent of poverty in their area, joining the End Hunger in the UK campaign. on the poorest people in South Yorkshire. Quaker and Jew Sue Beardon, a member of our meeting, has written an opinion piece for Quaker magazine ‘The Friend’, published 9th September. See attached for full text. For more about The Friend, visit https://thefriend.org. Proposed new project to research the fascinating story of Quakers in our area. Many of you may already know that the famous artist, Ruskin, established a museum for the people of Sheffield in Walkley in 1855. You may not know that its first curator, Henry Swann, was a Quaker. Swann was a vegetarian and one of the first people to introduce the bicycle into this country. He also tried (without success) to popularise a new athletic exercise of boomerang throwing. Swann is just one of a fascinating line of local Quakers about whom most of us know very little. 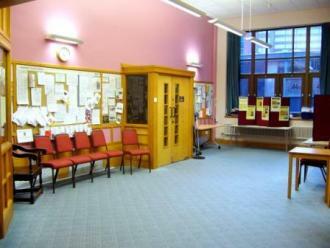 However, we do have extensive Quaker archives – in our own meeting house and in local libraries. One Sheffield Quaker is currently wondering whether any Friends would be interested in setting up a group to research the fascinating story of Quakers in the area. This might result in a publication and/or a series of exhibitions which would make useful outreach material. Maybe this proposed project could also incorporate some of the research which Friends have recently undertaken into conscientious objection in Sheffield? This project is being advertised in our latest printed newsletter but we never give personal details of individuals, such as names and email addresses on this website. At Area Meeting we consider reports from Friends who have attended various conferences and events. On Saturday 7th June, at Bamford, we had a summary of a very interesting report on a conference on the subject of moving towards a low-carbon society. Read on here for the start of that report…. Creating transition to a Low-Carbon,Sustainable Society – how do we do it? together – all strangers to one another. Politeness continued through the soup course. Then, as we tucked into vegetable kievs, the topic of recent documentaries on the First World War arose. One of my companions maintained strongly that Max Hastings’ view was essentially correct – Britain did the right thing in entering the war, there was no real choice. Needless to say, not everyone agreed – and the conversation gained an “edge” to it. “Ah, good,” I thought – controversy! That’s what we’re going to need this weekend. So how do we create a transition to a low-carbon, sustainable society? Finding answers to this question is at the heart of the Canterbury Commitment, made at the 2011 Britain Yearly Meeting in Canterbury. What’s been happening since then? Where are we now? Where are we going next? These were the questions posed by Lis Burch, Clerk to the Gathering, before we retired for our cocoa on Friday night. I had the distinct sense that Lis would keep us – over 100 of us – firmly on track over the next two days. Maybe you could obtain some funds to help run your outreach event? 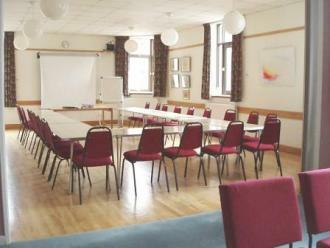 Do you know that funds may be available from Quakers in Yorkshire for outreach events? The Quakers in Yorkshire (QIY) Outreach Projects Committee (OPC) was set up in 2013 to promote outreach, to receive grant applications and to provide funding assistance. Accountable to the QIY Trustees, the OPC comprises one representative nominated by each of the area meetings in Yorkshire and a Clerk/Convenor nominated by the committee in consultation with the QIY Nominations Committee. All these Friends are appointed by Quakers in Yorkshire. The role of the Area Meeting Representative is to make Friends in their area aware of this fund and to advise on the application process. This guidance is available to any Friend or Attender within the area covered by Quakers in Yorkshire. The completed Application Form should be sent to: Annabel May Webb who is the Clerk of the Outreach Projects Committee, Quakers in Yorkshire – for her email address please contact Kathleen Wallace, Area Meeting Rep for OPC. Please include your email address so we can easily get back in touch with you. Please take extra care to type it correctly. Check which room or rooms you would like to book. If you are not sure which room(s) best meets your requirements, check the one that seems to be the best fit and add a note below in the ‘Any other questions or comments’ box. 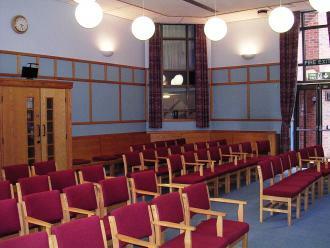 We can discuss with you which rooms are available and would work best for your meeting / event. 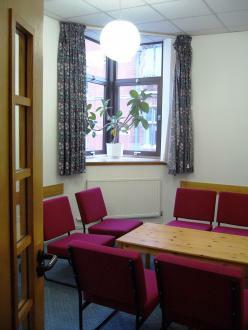 Lower Ground Floor Room 4. Seats up to 35 and includes a well equipped kitchen. Is there anything else you might need? If you have any questions please enter them here and we will do our best to provide a prompt response. This self-contained space is suitable for up to 35 people and includes a well equipped kitchen which you can use to make and serve your own refreshments if you prefer to be self-sufficient. 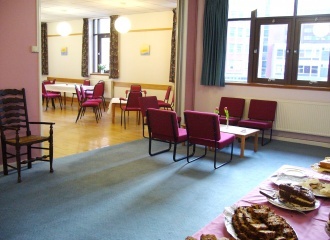 This area is where we serve food and refreshments for groups using the first floor and large groups using the ground floor. We can serve buffet food to a maximum of 100 people but there is minimal seating space. 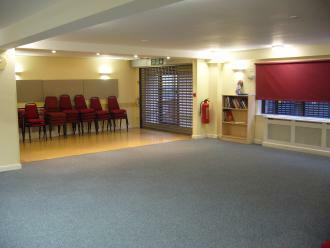 Some groups wishing to book the whole top floor will have exclusive use of the space. However, this needs to be booked well in advance and exclusive use may not be possible. 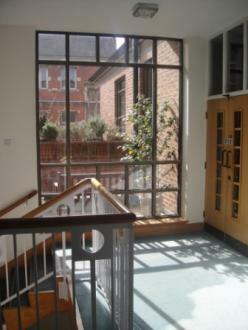 There is also a delightful small terrace with seating and flowers for your use on this floor. This holds up to 12 with low, comfortable chairs and a coffee table. 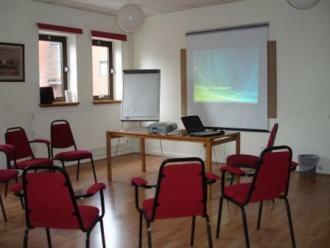 It is suitable for small, informal groups, counseling and interviews. This room is on the first floor next to the kitchen. It has a laminate floor. This light and airy room has three sets of windows, a wooden floor and stacking chairs. Large doors can be opened into the social area, for example to accommodate exhibitions or large buffets. 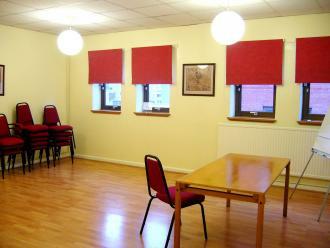 This is a large, comfortable room with fitted carpet, cushioned chairs and air conditioning. 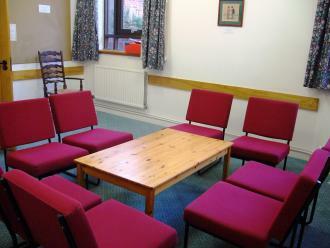 It seats up to 100 but is equally suitable for smaller groups. It has a fixed hearing loop. It also has a grand piano. 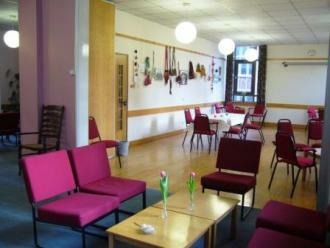 Refreshments and food are served in the adjacent social area which holds up to 30 people. 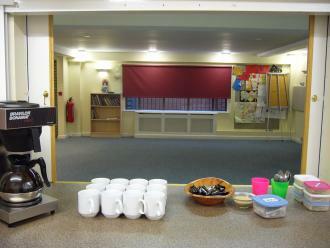 Refreshments for larger groups are served in the first floor social area.